Is Spring 2016 a repeat of Spring 2012? The warm temperatures encountered in the first half of March of 2016 are reminiscent of the extreme early spring encountered in 2012. However, if you compare this year’s spring temperatures with the 30 year average, we are above average but nothing like 2012. 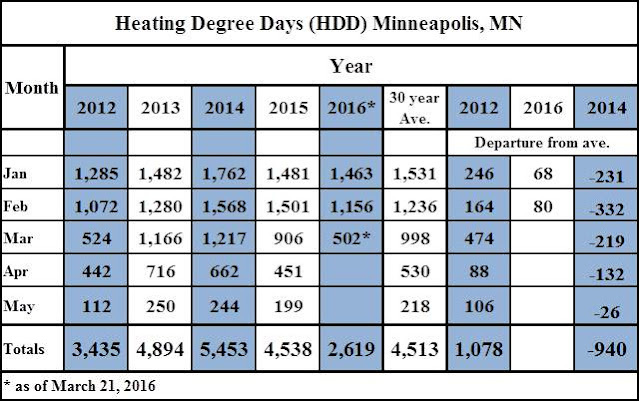 One way to compare temperature data among years is to create a statistic called a Heating Degree Day (HDD). This number is created by taking the average temperature for the day and subtracting 65 degrees. The average temperature for the Twin Cities yesterday March 21st was 41 degrees, and thus the HDD was (41-65 = -24). The idea being that in that day the heat required providing for the 24 degree difference between the 65 degree reference building temperature and the 41 degree average outside temperature was 24. So the HDD for March 21, 2016 was 24. The 30 year normal for March 21st is 35 F, so the HDD for the average is -30. If we sum these numbers for all the days in a month then we can compare months between years. The summed HDD for the month of January for the years 2012, 2014, 2016, and the 30 year average were 1,285, 1,762, 1,463, and 1,531, respectively. The lower the number the less heat required. 2012 was 246 days lower than the average and 2016 was 68 lower than the average. In 2014 the HDD for January was 231 more than the average and thus a relatively cold month. If we compare the HDD for the month of March for the same years 2012, 2014, 2016, and the 30 year average we get the following (*with the understanding that we still have 10 days left in March of this year) 524, 1,217, 502*, 998, respectively. So we are early but not like 2012. Damage experienced from late spring frosts is a function of the temperature sensitivity of a bud which in turn depends on its type and its stage of growth. For example: A tight strawberry bud can tolerate temperatures down to 22 F. As the bud begins to open and approaches a “popcorn stage” the critical temperature rises to 26.5 F. The fruit’s critical temperature is 28 F, and the flower itself is most sensitive with its critical temperature being 30 F.
Deciduous fruit trees follow a similar pattern although the temperatures will not be exactly the same. See the following link to get more detailed information. The extent of frost damage depends on the low temperature reached and the time it spends at that temperature. To some extent frost protection becomes a local phenomenon and depends on the microclimate experienced by the plant. This is determined by your exact location and its topographical characteristics. Is your plant protected in some way by your home? Large bodies of water moderate air temperatures and urban areas with buildings and pavement as heat syncs that can radiate heat back at night. Topography is a factor. Southern facing slopes with early spring warmth can encourage fruit trees to flower earlier and be more vulnerable to late spring frosts. Air drainage is important. Fruit trees planted in an area where cold air collects can experience colder temperatures then plants on the upper part of slopes. In terms of the year, yes we are early and we need to keep an eye on things. That being said the predicted upcoming cooler weather with lows in the high 20’s and low 30’s will likely not damage many buds and will slow plant growth reducing our risk of late frost damage.